There’s no doubt about it: when it comes to cars, we need them as much as, well, they need us. We depend on cars to get around but they come with plenty of problems. And unfortunately, most of us also aren’t car mechanics. Taking your car to a real mechanic can get really expensive really fast. One of the best ways to avoid the expense of visiting an auto body shop is by keeping up on maintenance on a regular basis. Whether this involves cleaning the car fixing minor wear and tear, or just keeping things together until it’s time for a real fix, we have some good news. 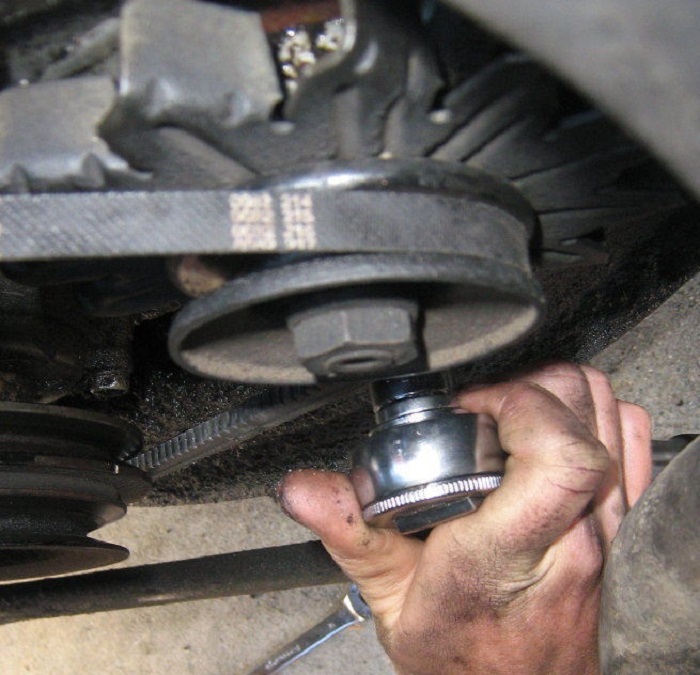 There’s no need for you to know anything about cars to take advantage of these helpful hacks. 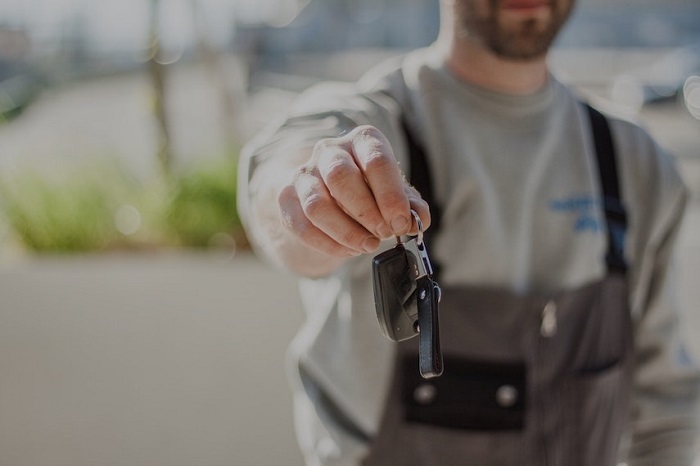 With the right kind of maintenance, you won’t just save money on repairs, you’ll also save money by extending the life of your car. Most people can’t afford to get a new car every few years, so it’s important to know how to take care of the one you have. 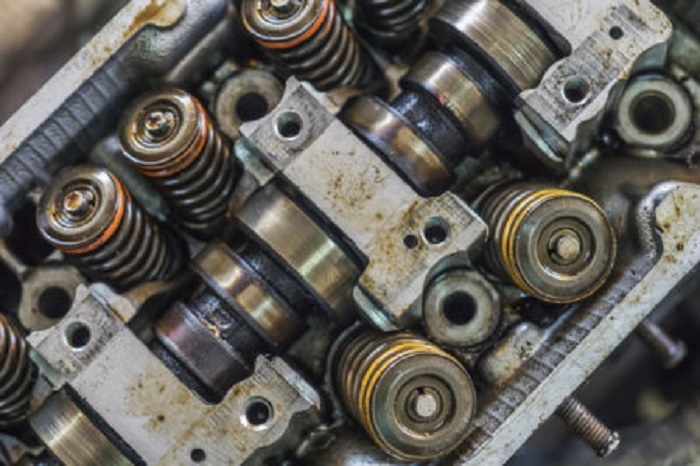 With these tricks, you’ll have everyone asking how you know so much about maintenance, even if you don’t know what a camshaft is. 1. Repair a dent with a plunger. 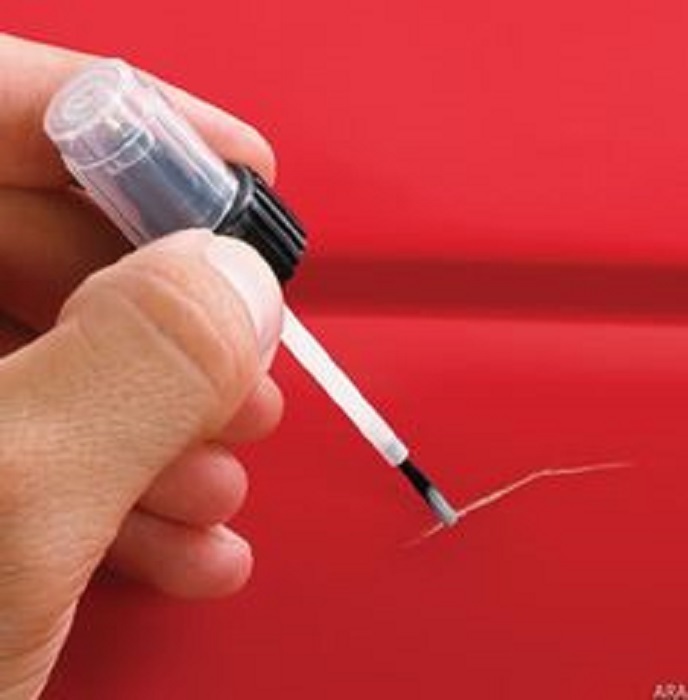 Dents can be one of the worst things that can happen to the exterior of your car. Believe it or not, you can actually repair them with a common bathroom item: a plunger! As long as the dent isn’t severe, you should be able to suction it out without a lot of effort. 2. 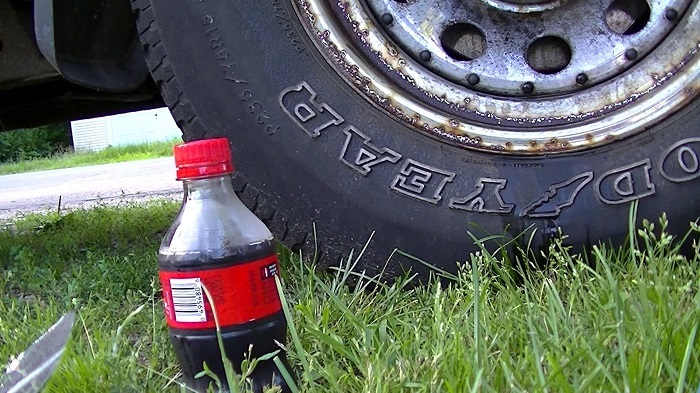 Remove rust with Coca-Cola. Coca-Cola (and let’s face it, most sodas) are highly acidic, which makes them a perfect cleaner. The corrosive abilities of Coca-Cola are actually so strong they can remove rust. If you have parts on the exterior of your car that need a shine-up, try it out. 3. Clean up fabric seats with some washing soda. Washing soda isn’t commonly talked about these days but it’s not hard to find. 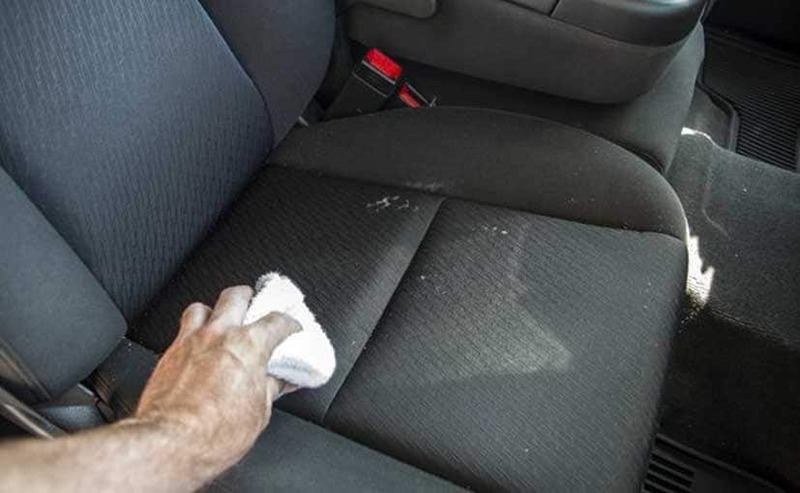 It’s one of the easiest and most effective ways to clean stains and other grime off your fabric seats. Just mix it with a little dish soap and water, then scrub away. 4. 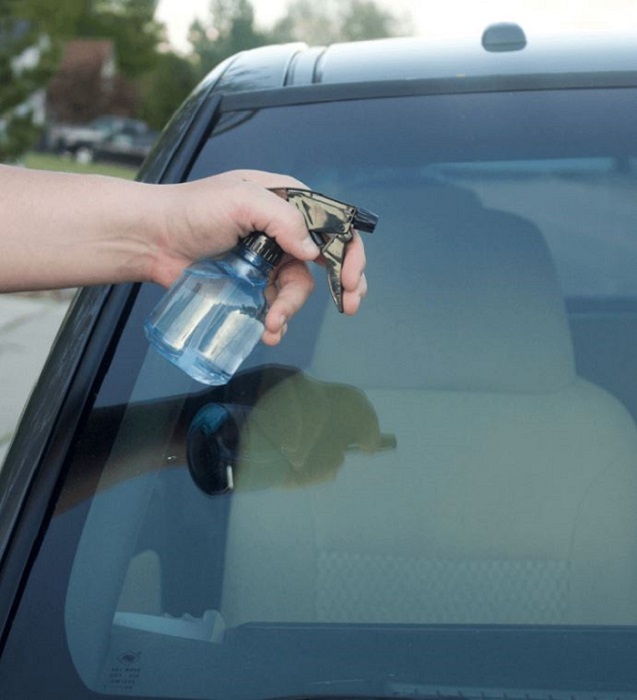 Scrub gunk from your windshield with club soda. Your windshield is your first defense against all the dirt on the road. Club soda is an easy way to remove all the grime. All you need is a cloth and a bottle of club soda: it’s that easy. You might think you need expensive, special materials to keep your car looking as great as possible. But you actually just need something found in any bathroom: a bottle of hair conditioner. 6. 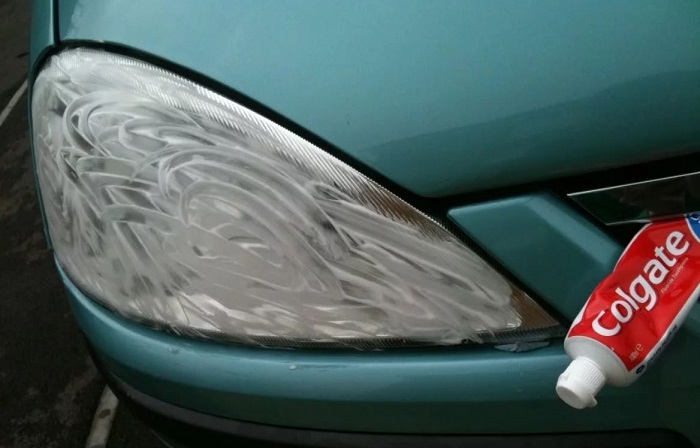 Brush away headlight buildup with toothpaste. Headlights are just like windshields: they get exposed to all the dirt on the road. They’re supposed to keep the road visible for drivers so you can’t let them get dirty. Thankfully, all it takes to clean them is a quick buff with some whitening toothpaste. 7. Conceal scratches in the paint with nail polish. There’s nothing worse than getting a scratch in your car’s paint job. However, there’s a simple fix even if it’s not the most traditional. Just head to the drugstore and find the nail polish in the color closest to your car. 8. Clean your windshield with a razor. If you need to clean your windshield but don’t have any cleaning solutions on hand, don’t despair. 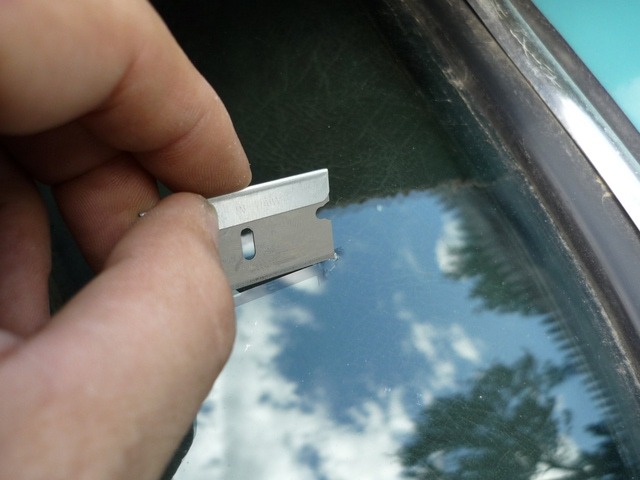 You can scrape the worst of the dirt and grime off with a regular razor. It won’t scratch your glass, just skim everything off. 9. 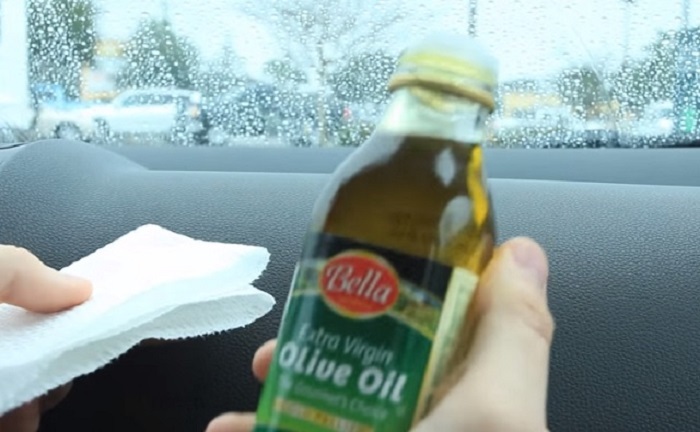 Shine your dashboard with some olive oil. If your dashboard is looking dull, there’s an easy way to shine it up. 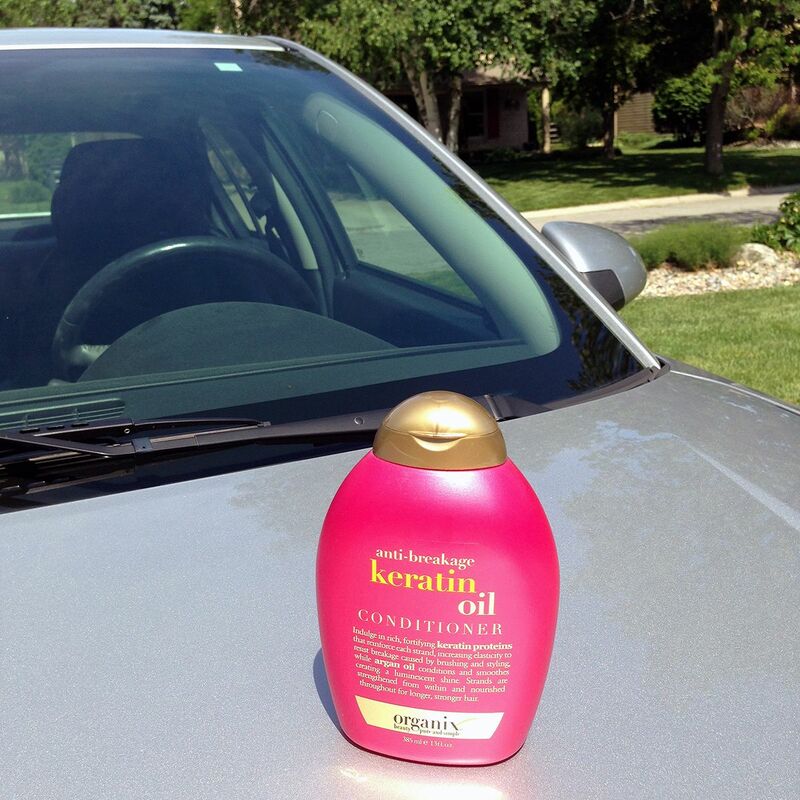 Grab a coffee filter and a bottle of olive oil then rub it into the dash. It will look great in no time, without any oily leftover mess. 10. Stop cracks in their tracks with nail polish. 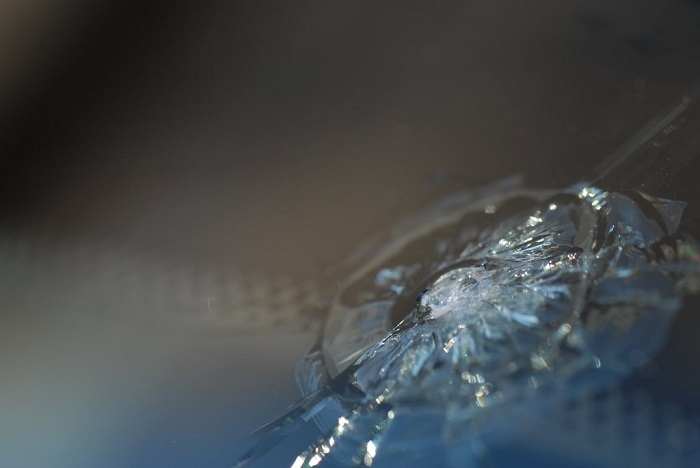 Getting a crack in your windshield is awful. However, there’s an even greater concern, the chance the crack will spread, destroying your entire windshield. Thankfully, you can stop the spread with a couple of dabs of clear nail polish. 11. 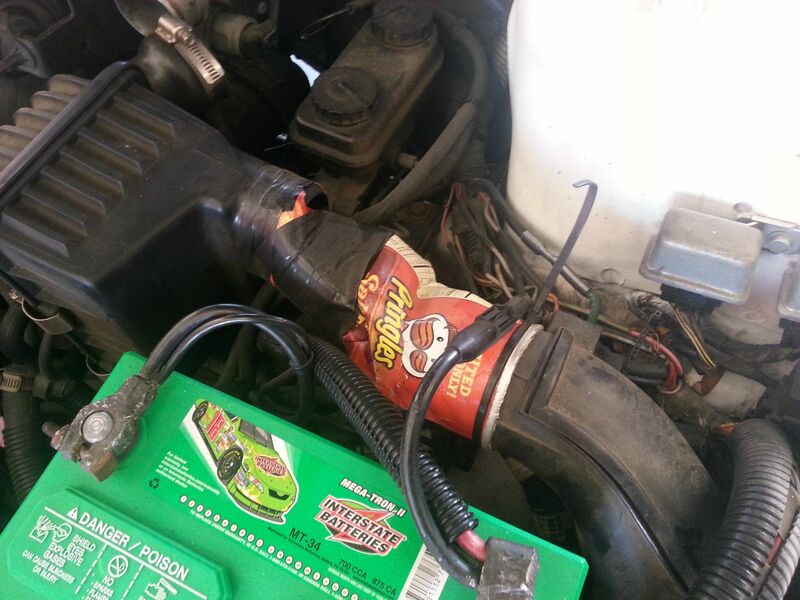 Become a car mechanic with a Pringles can. This hack isn’t intended for long-term use but it should be enough to give you time to get to a mechanic. If you have a pipe that breaks, you can rig up a quick fix with a Pringles can and a spool of duct tape. 12. Heat up dents with a hairdryer. 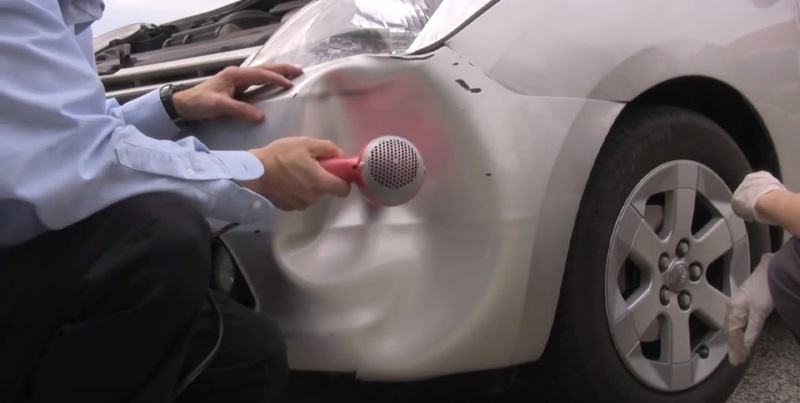 Here’s another way to help dents pop out of your car: a regular hair dryer. You’ll also need an air duster (the kind used to clean keyboards). 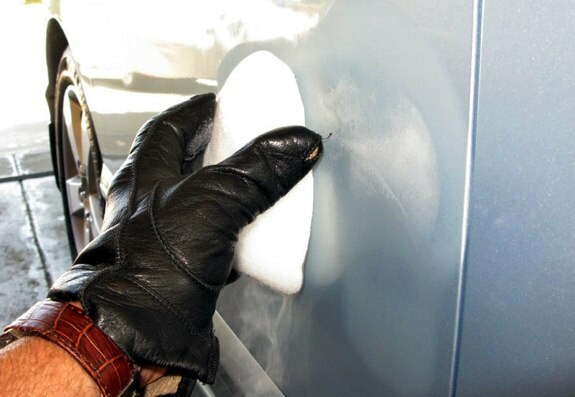 Start with heating the dent for a few seconds, then spray the air duster until the dent pops out. 13. Keep an easy, breezy keychain. You might not give much thought to what you keep on your keychain. But the heavier your keychain is, the more it will wear on your ignition. 14. Play with dry ice to get dents out. Dry ice is another great way to smooth dents over. You’ll need a hair dryer for this one too, as well as a pair of gloves to protect your hands. Warm the dent, then gently rub the dry ice over it. 15. Clean your engine regularly. 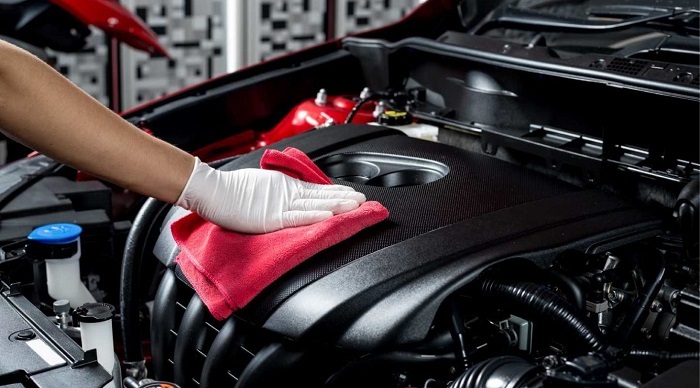 You probably don’t think about cleaning your engine. It’s a great way to prevent unnecessary maintenance and repairs. All you need is dish soap and water (and some plastic to protect under your hood). 16. Keep your windshield safe in extreme temperatures. Both extreme heat and extreme cold can be bad for your windshield, even causing it to warp or crack. 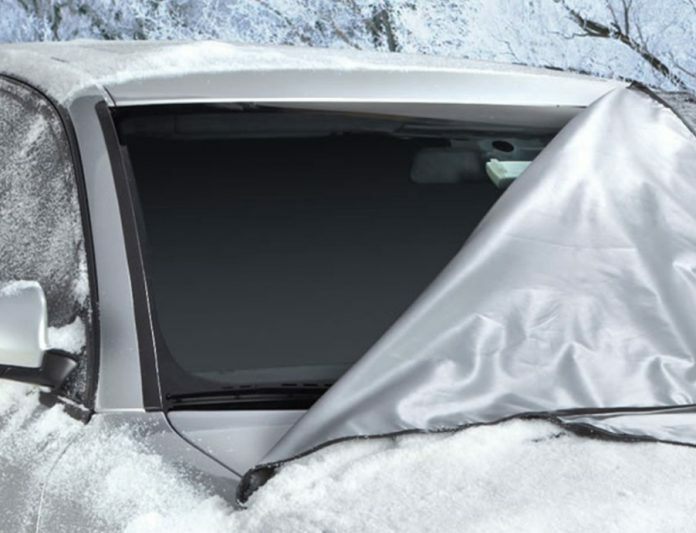 It’s a good idea to cover your windshield with a tarp or protective cover when it gets extremely cold to insulate the glass. 17. 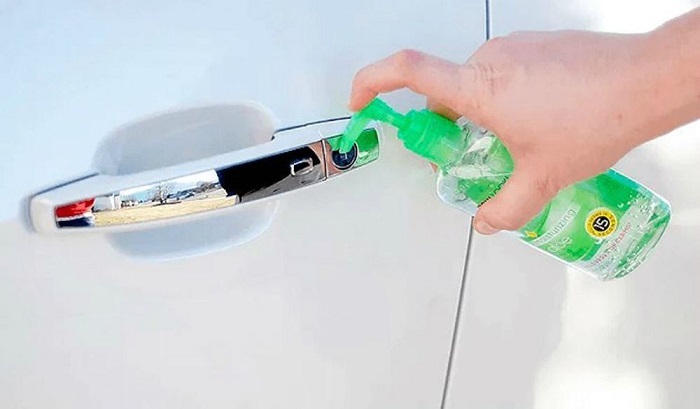 Keep your door handles ice-free. When your door handles freeze, you can’t get into your car. Frozen handles are also a good way to break your car door. Here’s the good news: all you need is a squirt of hand sanitizer to clear the ice. 18. Do a quick fix on your timing belt. This is a fix that’ll last until you get to the mechanic: if your timing belt is out, open your hood, remove it, and replace it with a pair of pantyhose. 19. 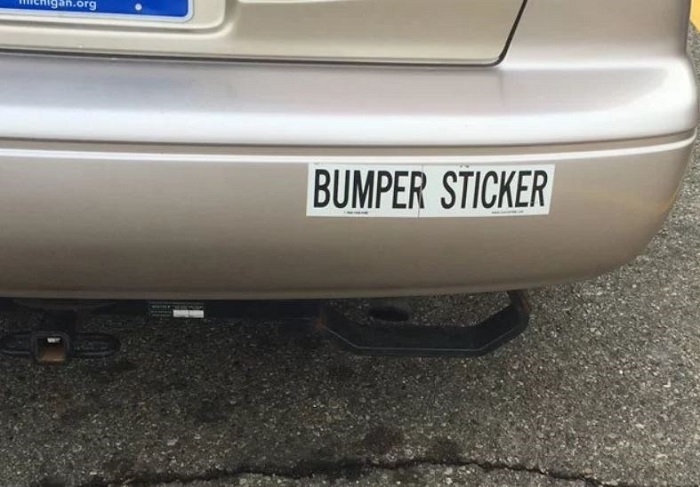 Take the fuss out of removing bumper stickers. 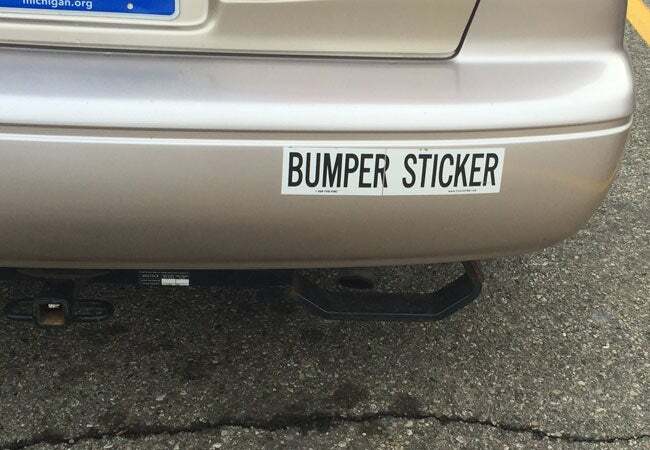 If you’ve outgrown your old bumper stickers, soak a wad of newspaper in water and slap it on whatever you want to remove. Let it soak for 10 minutes. Your sticker will peel off easily! 20. Take care of your wipers with socks. Give your wipers a little TLC. 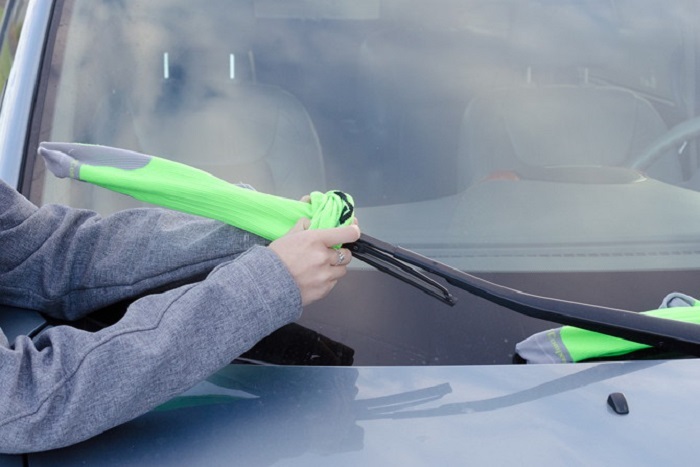 To keep them from freezing to your windshield in the cold, prop your wipers into the upright position and fit them with a couple of socks to keep them toasty. 21. Clean crevices with a screwdriver and a cloth. There’s nothing like trying to get dirt and crumbs out of the crevices of your car. 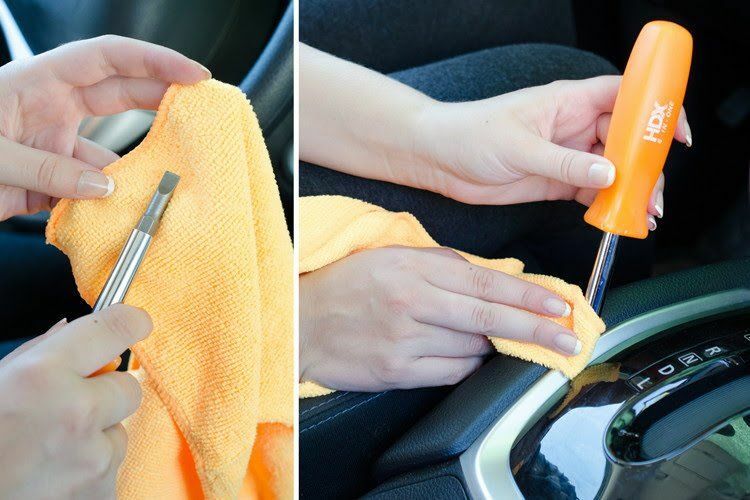 There’s an easy way to reach them: just wrap a thin cleaning cloth around a screwdriver and go to town. 22. Plug your fuel tank with candy or gum. This might seem unbelievable, and you should know that it’s not a long-term fix, but if you have a fuel leak, you can actually plug it with a wad of gum or other sticky, chewy candy. It’ll get you to the mechanic safely. 23. 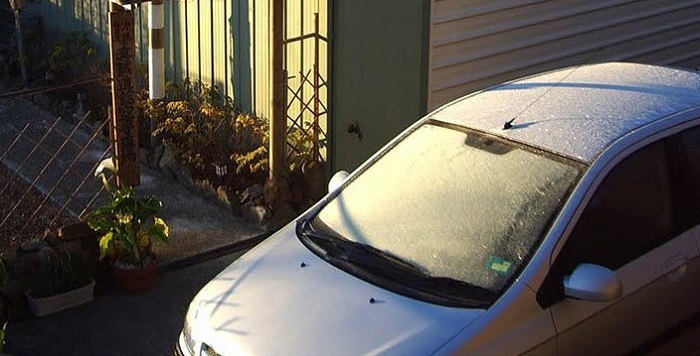 Use nature to help your car defrost. There are all sorts of hacks to keep your windows free of frost. The simplest? Park facing east so the rising sun goes to work on your windows. 24. Use a pair of pantyhose on your fan belt. 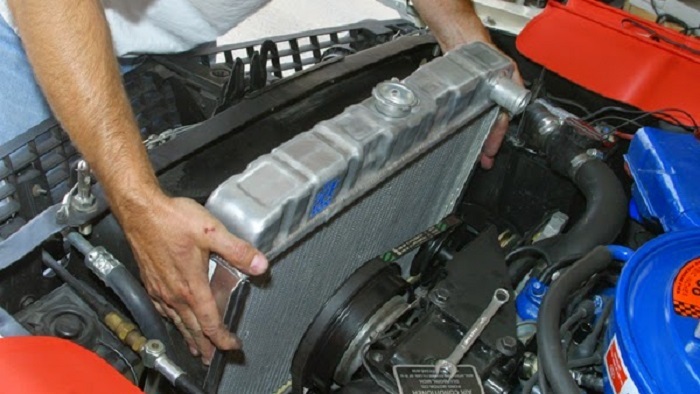 Just like the timing belt trick, you can temporarily replace your fan belt with a pair of pantyhose. Don’t rely on it for more than a drive to the mechanic, though! 25. 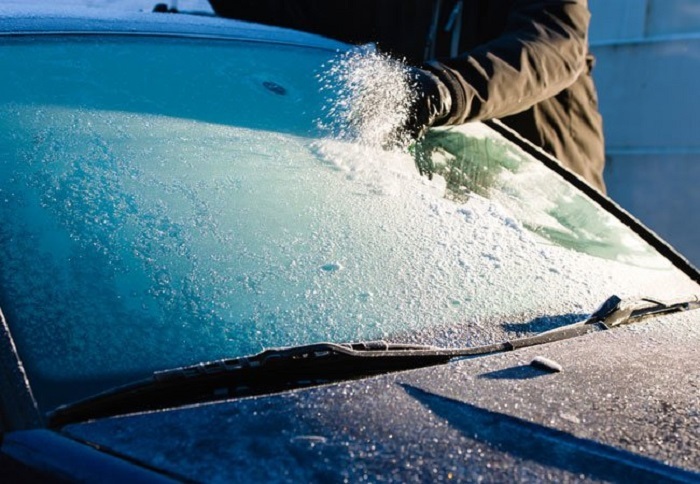 Use this trick to defrost your windows fast. 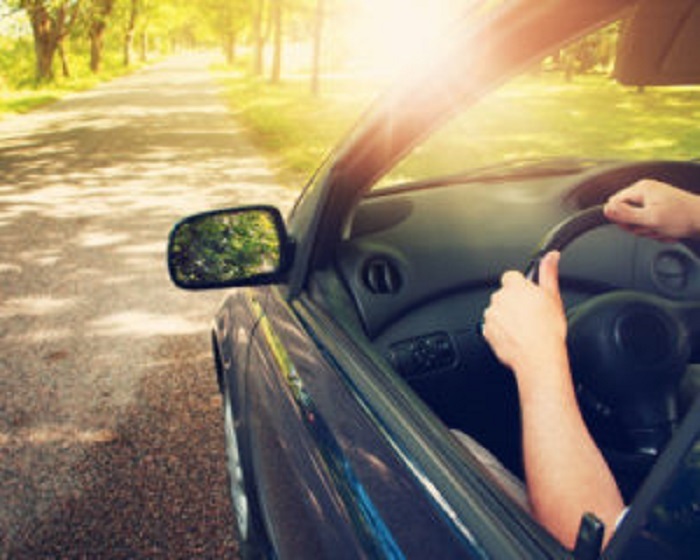 Keep your car dry by alternating between heat and air conditioning with your windows open. The condensation on the glass will dissolve. 26. And THIS trick to cool your car in a jiffy. To cool your boiling hot car down, open your driver’s side door, then open your passenger door and pump it open and closed a few times. 27. 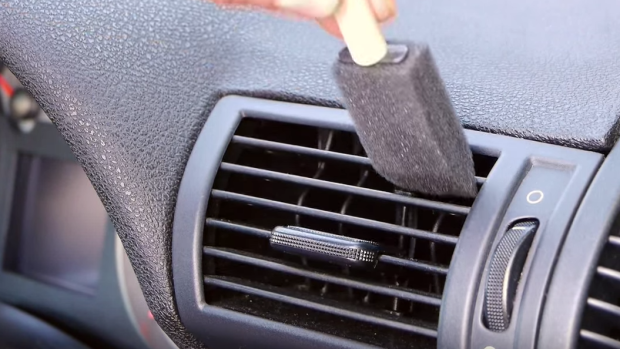 Keep your air vents clear with a paintbrush. Air vents collect a lot of dust and dirt, which is hard to clean. The good news is that you can get into those hard-to-reach places with a regular paintbrush. 28. Use plain old dish soap to buff your hubcaps. Sometimes, cleaning and maintenance for your car are pretty straightforward! If your hubcaps are looking dull, just give them a shine with regular dish soap. 29. Scrub away dead bugs with dryer sheets. 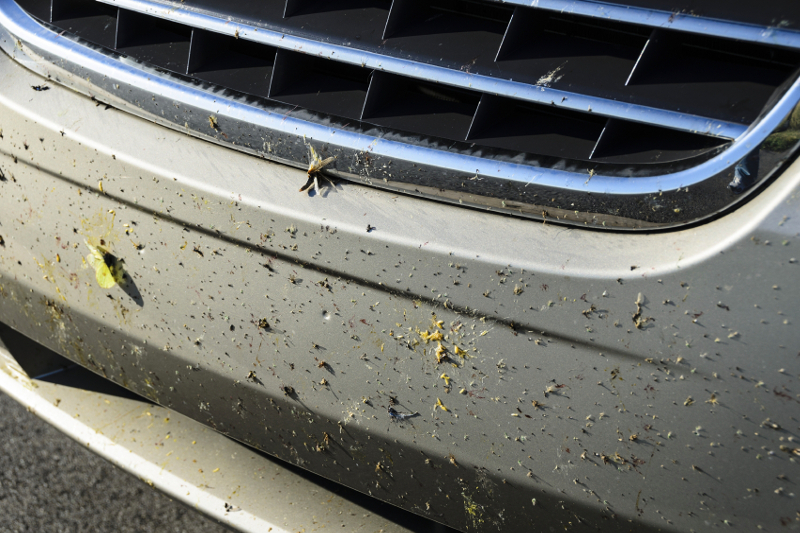 When bugs hit the front of your car, they have the tendency to get, well, glued there. There’s an easy fix that uses a regular household item: a dryer sheet. 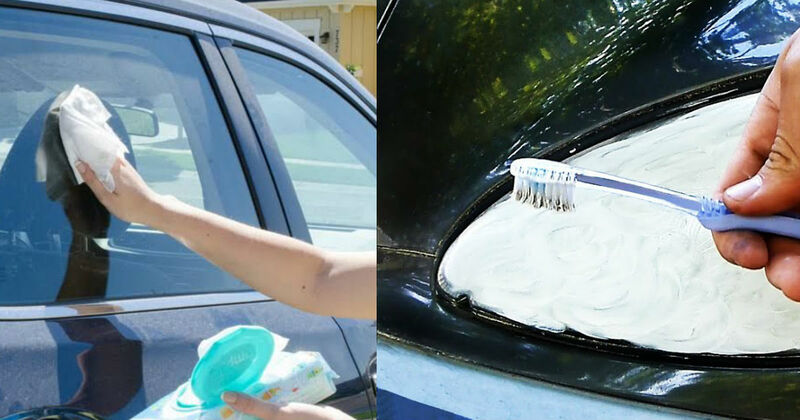 Just grab the dryer sheet, wet it with water, and give your car a scrub. 30. 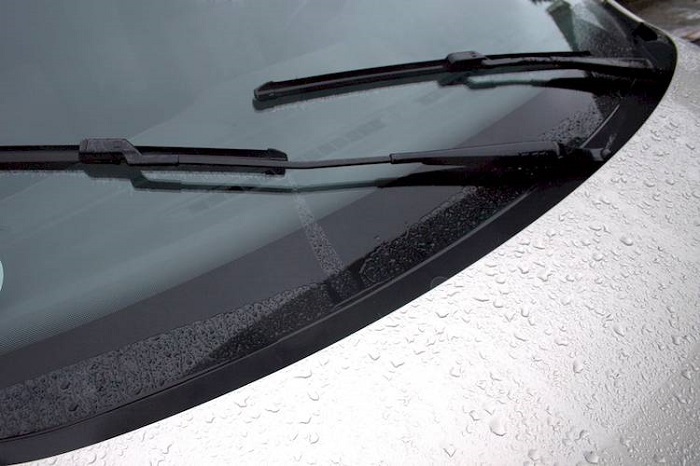 Use this trick to repair your windshield wiper in an emergency. If you need a quick fix for a broken wiper blade, wrap a sock or a pair of pantyhose around the wiper. It’ll do the job until you can replace it. 31. 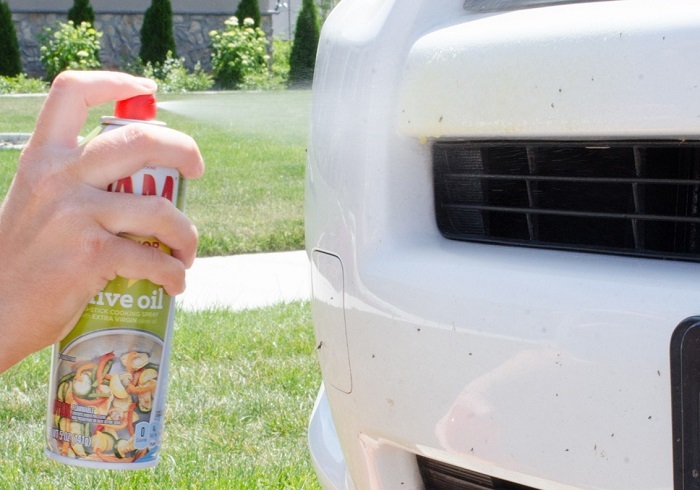 Tackle bug bodies with cooking spray. If you need another way to loosen up some unfortunate bug bodies, all you need is a cloth and a little bit of cooking spray, like Pam. Spray it on your car to loosen the insects and wipe away. This one might seem unbelievable, but we checked — it’s real. If your radiator is leaking and you’re just trying to make it to the auto body shop, you can use some bodily fluids to fill it up. If you have a full bladder, you can kill two birds with one stone on the road. 33. Use cat litter to keep your windows clear. Cat litter is made to absorb moisture. 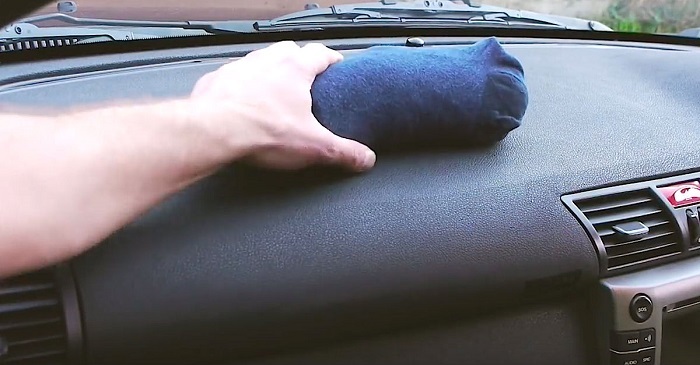 If you fill a sock with a scoop of litter and hang it in your car, it will absorb any condensation that would otherwise collect on your windows. 34. Or try this trick straight from the medicine cabinet. Want another way to keep the condensation off your windows? Use a little bit of shaving cream. Spray it on the inside of your windshield and wipe away. It may seem crazy, but it actually works! 35. Or use an easy DIY spray. If you don’t want your windows to freeze overnight, there’s an easy spray you can make in your kitchen. Just mix some vinegar and water. This can either be sprayed directly on the ice to dissolve it or used as a preventative measure to keep the ice from forming in the first place. 36. Prevent your doors from freezing with a little cooking spray. Here’s another preventative measure you can take. 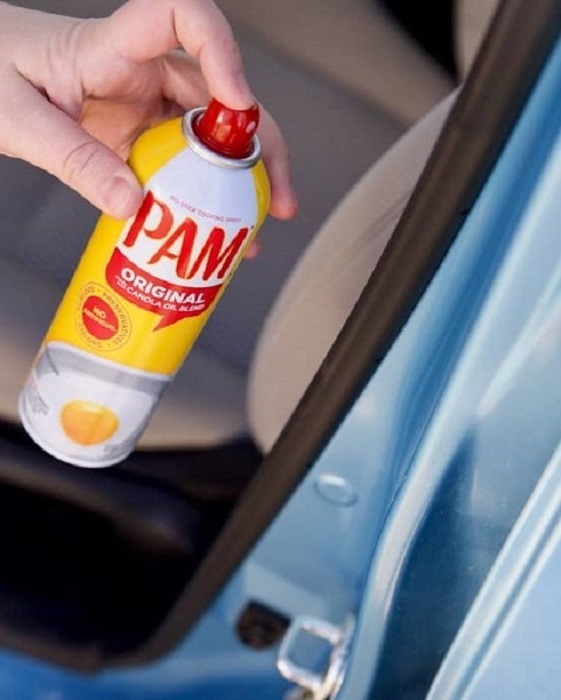 In the dead of winter when your car doors are likely to freeze overnight, spray the inside rubber part with cooking spray like Pam. 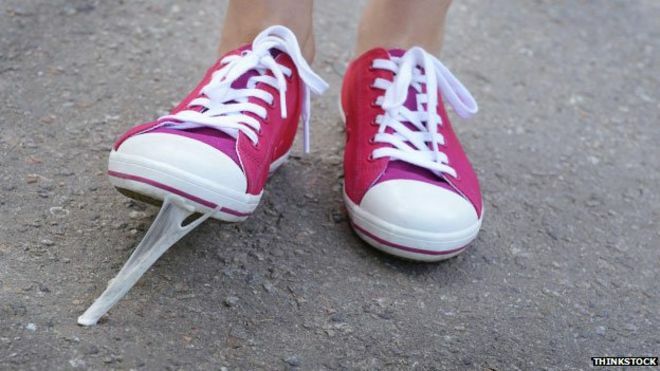 This will keep ice from forming. 37. Use this temporary gasket fix to get you to the mechanic. If you’re stuck miles away from the auto body shop without a gasket, you can shape a temporary one out of an orange juice carton until you can get it fixed. 38. Keep your door safe from dings with pool noodles.